However I took up one of those deals where you could order a certain value of food for a discounted price. Marquee offers around four different courses, from Tastings, Entrees, Mains and Desserts. 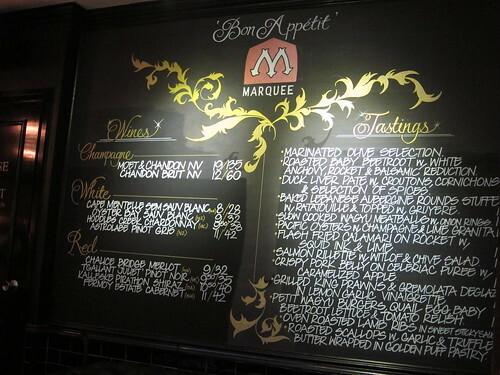 Primarily Marquee Restaurant serves European food, with a large mix of French dishes. 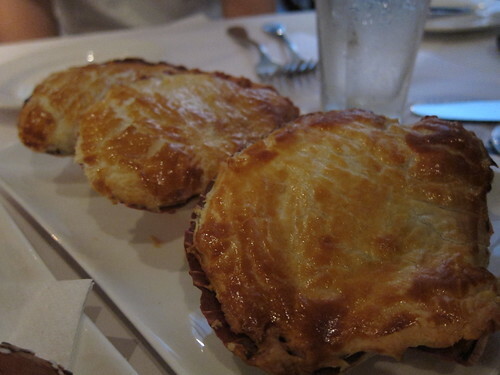 We first ordered from the Tastings menu with their Roasted Scallops with garlic and truffle butter wrapped in puff pastry. I love scallops, and pastry so this was always going to go down well with me. The scallop was perfectly cook, not tough or chewy at all. It simply melted alway in your mouth, as best as a scallop could do anyway. The garlic and butter add the nice flavour to the dish and with the crunchy and thin pastry on top it works nicely together. These little burgers from the Tastings menu are Petit Wagyu Burgers with quail egg, baby beetroot, lettuce and tomato relish. This tiny things were so cute, just look at them! Almost too lovely to eat, almost. 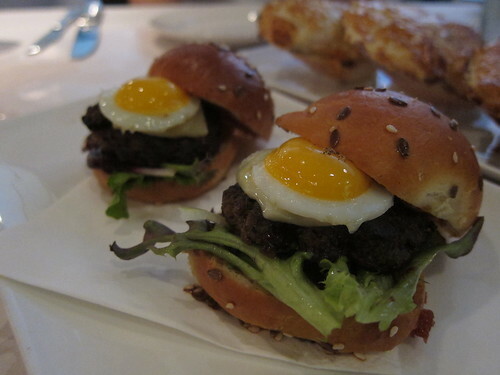 I loved these little burgers, they were absolutely delicious, with the ooze from the egg yolk making the burger moist and the wagyu wasn’t try either. I loved it. 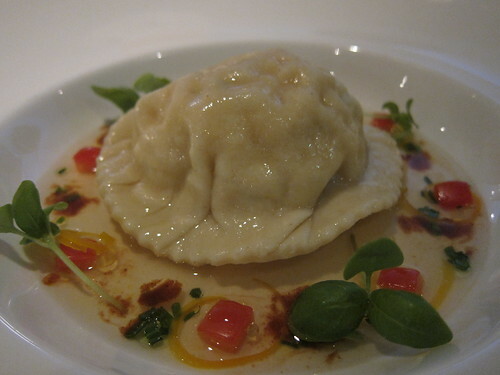 We ordered an entree too, this was the Hand-made crab and salmon raviolo, tomato consommé and baby basil cress. This was a bit disappointing to be honest, the crab and salmon filling in the raviolo was kinda bland and almost tasteless. Even the tomato consomme didn’t help with the flavour. Overall, I couldn’t find many redeeming qualities in this dish at all. 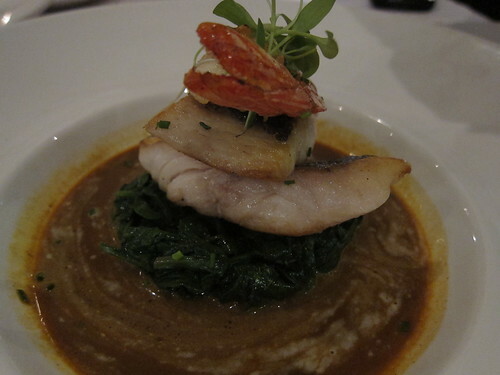 One of the mains we ordered was the Baby snapper fillet with smoked prawn bisque and grilled prawns. The snapper was nicely cooked, and the spinach had nice tangy flavour. The sauce was quite good, a tad on the salty side though. The seafood was supposed to be the highlight or the centrepiece of the dish, however, the prawns were somehow bland and lacked prawn flavour. Overall, it has some good points but would I order this again? Probably not. I’ve always heard good things about Duck and Orange together. So I was so excited to order the Honey glazed duck breast on confit duck leg with chive mash and orange and balsamic jus. This was so good. The duck was amazing, so delicate and soft, just perfectly cooked and just melts away. 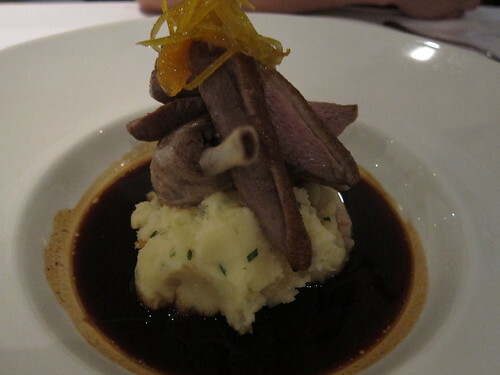 The orange peel was slightly candied, and added a really nice different taste to the duck. I loved the balsamic jus too, I don’t think I’ve actually ever had jus before but my golly was it strong and tasty. Slightly salty, sweet and all things good. As you may know, I love potatoes, so the mash will always end up on a positive note. Overall, I loved this dish. The duck and the jus made this dish. 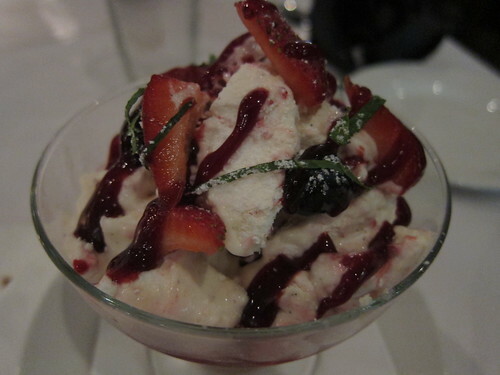 I wanted a lighter dish to end my night at Marquee, so we ordered the Eton mess with strawberries, chantilly cream, smashed meringue, ice cream, strawberry coulis and mint. I quite liked this, the meringue was nice and crunchy but light, and with the strawberry coulis (it’s just a jam) it was tasted quite fresh and summery. The slightly sour strawberries worked well with the sweetness of the coulis and sweet meringue, and the cream added a nice richness but not overpowering. Overall, it was good, but not a “must order” dessert. Marquee Restaurant offers a nice selection of dishes, with plentiful that are tasty and satisfying. Would actually make me want to go there full price now that I’ve tasted their food. If you go to Marquee Restaurant, the duck is a must. I fine the prices to be on average slightly pricey, but I think that’s just the norm with these kind of restaurants. Marquee would now be on my list of places to dine on special occasions so I’m definitely glad to have dined here.